Call 877-433-POOP or 302-322-4522 locally. Call now for a FREE WEEK of SERVICE! Delaware Pooper Scoopers, Inc. Pet Waste Removal Service strengths include almost 10 years in the pet care business, servicing 400+ satisfied clients with a Satisfaction Guaranteed policy from day one you can count on. Professional, friendly, Uniformed employees are always dispatched. We offer complete Deodorizer & Disinfectant systems. We deliver your Pets Products directly to you! Dog poop scooping services for these Delaware Cities- We cover all of New Castle and Kent County: New Castle, Wilmington, Newark, Elsmere, Hockessin, Greenville, Centerville, Augustine, Delaware City, Townsend, Middletown, Odessa, Smyrna, and Dover, DE. "We Scoop What Your Pets Poop." Shyla, the owner of this very popular dog waste removal company states, "Our business is dedicated to making life easier for pet owners by cleaning up and removing waste (feces) from customers yards, pen, and/or living areas. Our work will provide a very high level of service quality with regard to reliability, thoroughness and courtesy." Need a pet sitter while your away? Maybe a dog walker to keep your canine in peak condition? Give us a call. We do it all. Picking up dog poop isn't a happy chore. Who has time to poop-scoop after a long day at work, running errands, or taking care of the kids? Before you know it, a few poops can turn into a big poop scooping chore. 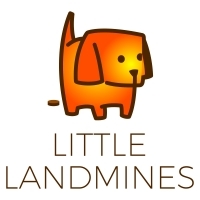 â€‹Enter Little Landmines, a professional dog waste clean up service in the MOT and surrounding areas. We like to think of ourselves as your local backyard "squat" team. We specialize in pet waste removal! We absolutely love all dogs, and have been known to spend a few minutes of quality time with them when we visit. â€‹One of our trained pooper scoopers will come directly to your property and scoop poop, so you don't have to! We are proud to hire United States veterans. Servicing New Castle County, Delaware and Delaware, Montgomery County and Chester County in Pennsylvania. CLEVENS K9 SCOOP is your solution to a dog waste free environment! Let us take care of the most unpleasant but necessary part of dog ownership. Our goal is to have the best dog waste removal service by always providing a professional, reliable, and affordable yard cleaning. We want you and your family to be 100% satisfied every time we clean your yard! Clevens K9 Scoop is a licensed and insured Animal Waste Specialist servicing Residential Yards, Apartment Communities, Home Owner Associations and Park & Recreation Areas. Yard cleanings start at just $9.99. Mention this listing and receive 50% off your initial clean-up. In DE call 302-376-6685 or PA 610-585-4527. We Scoop Your Pet´s Poop! Tootie´s Poop Patrol removes pet waste from your property or living area. They are a professional pooper-scooper business that provides once a week, twice a week, every other week or more often for your dogs needs. Supporting dog owners in both Sussex County & Kent County and are located in the Lewes, Rehoboth area. 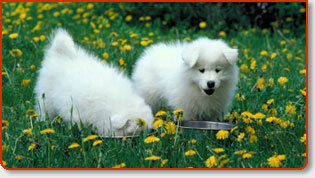 We also offer pet sitting and routine dog walking. Contact us TODAY for a free quote! They support these cities and many more: Lewew Rehoboth Millsboro Milton Dewey Beach Millville Harbeson Angola Georgetown Dagsboro Warwick Ellendale Bethany Beach Ocean View Selbyville South Bethany Frankford FenwickIsland Argos Corner Midway & Pinetown. 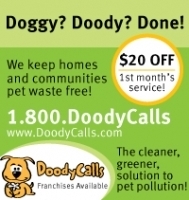 Doodycalls Pet Waste Removal provides dog poo cleaning service to Kent and Newcastle, DE and Cecil County, MD including the following areas: Avondale, Bear, Camden Wyoming, Clayton, Dover, Elkton, Felton, Frederica, Hartly, Hockessin, Kennett Square, Landenberg, Magnolia, Marydel, Middletown, New Castle, Newark, North East, Smyrna, Toughkenamon, Townsend, Viola, Wilmington, and dog waste cleanup in Yorklyn as well. The following franchises provide pet waste removal service in Delaware. They are available to clean residential yards, as well as commercial properties including apartment complexes, HOAs, and public municipal parks locations on an ongoing, routine schedule. Once a week, large one time only dog waste cleanups as well as more often- give us a call and let us know your lawn maintenance needs for your individual property. Irrespective of whether it be the dog days of summer or the freezing cold months of winter, you need not be the one playing weekend pooper scooper for your dogs any longer. Yes, I know you love your dogs. But do you love cleaning up their dog poop when the thermometer mercury is about to burst? If you’re like me, you can think of a lot better ways to spend your free time. Well, thanks to professional pooper scoopers like those listed here, you no longer need to be concerned about cleaning up your dogs weekly poop deposits. Put your “poop detectors” away and stroll confidently through your yard. How? Hire a professional pooper scooper to take full responsibility for routinely visiting your home and removing all your “canine landmines”. Not to be left out, many of these dog waste removal services have been servicing cat litter boxes as well. You may contract to have these professional Delaware pooper scoopers cleanup after your dogs and cats. This is THE premium service for those of us who have dogs and cats but find the necessary task of picking up after them a bit unsavory to the taste buds. There’s not a bigger let down when you want to take advantage of a quick wrestling match with the dogs before supper or settle into a impromptu game of wiffle ball with your challenging kids, only to find yourselves knee deep in doggie poop. I speak from experience here. I grew up playing “dodge ball” and “pickle” in a lot of my friends’ backyards that had pets. The joke amongst us still today was that we spent a lot more attention and sweat on attempting not to “step in it” than we did on actually dodging the ball from hitting us. Believe me, and I think you would agree, there is nothing like having a asthetically clean, odor free lawn and garden that you are proud to invite your friends and family over to enjoy with you and your pets. Did I forget to mention all the time and arguments you’ll save yourself and family? Completely avoid this hassle altogether and contract one of these Delaware pooper scoopers if you ever want a fighting chance to make it out of the poop mines alive!